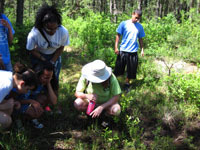 The PINELANDS Field Program focuses on New Jersey's most misunderstood ecosystem, the pinelands, or "pine barrens". Far from lifeless, the pinelands are home to many wonderfully weird species of plants and animals that are unable to live ANYWHERE else in the world. During this program, you will visit a former cranberry farm that is in the process of returning to its natural state. The pinelands site is located just outside of Chatsworth, NJ. Topics include: the uniqueness of the pinelands ecosystem, fire ecology, native pinelands species, and pinelands preservation. 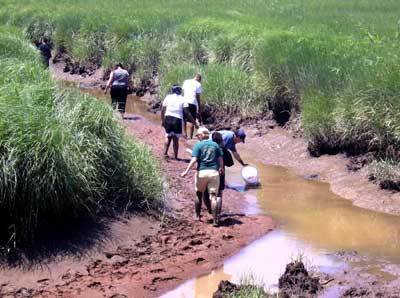 The SALT MARSH Field Program takes a closer look at life between the tides. 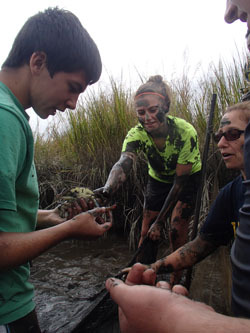 During this very muddy, outrageously fun program, you will wade in the creek beds to collect fish, sink in the mud to chase crabs, and experience one of New Jersey's most important ecosystems in a way very few people get to. The salt marsh site is located just outside Salem, NJ. Topics include: salt marsh ecology, migration, native vs. invasive species, threats to the salt marsh, and marsh conservation. Note: a "dry" version of this trip is also available during the colder months of the year, or for groups desiring a less rigorous experience. The BEACH Field Program allows adventurers to explore the shore beyond beach balls and boardwalk fries. 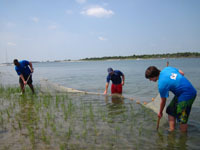 During this program we will beachcomb, seine net-fish, and observe shore birds. We'll delve deeper into what makes the Jersey Shore not just wonderful for summer fun, but also a vital habitat for many creatures. The beach site is located just outside of Ocean City, NJ. Topics include: tides, fish, invertebrates, and birds of the North Atlantic, food webs, and beach conservation.